Tonight we got our first look at Dredd, the rebooted adaptation of Britain's favorite dystopian super-cop, Judge Dredd. Yes, this movie is ultra-violent, and no, Karl Urban doesn't take his helmet off. But amidst the bullets and blood, Dredd leaves some questions about its heroes' role in their dystopian society while taking a very artistic approach to 3D movie violence. 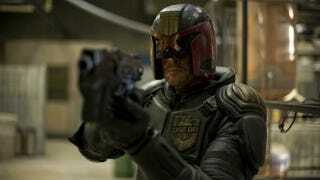 First off, let's just get this out of the way: Dredd in no way evokes Sylvester Stallone's turn as Judge Dredd. Wipe that movie, and the whites of Dredd's eyes, clear from your mind. Dredd takes us inside Mega-City One, the Eastern Seaboard-spanning metropolis that insulates its citizens from the atomic ruins of the Cursed Earth. This is a land of endlessly criss-crossing highways, smog, and high rises that function as cities unto themselves. It's as if someone extrapolated the worst possible version of Los Angeles, and then added the occasional flying police cruiser. It's in this city that Judge Dredd (Karl Urban) and the rest of the Hall of Justice wage war on crime in an efficient, if not entirely winning, manner. And after Dredd has dispatched with his latest set of lawbreakers, who were operating under the influence of the time perception-altering drug Slo-Mo, he gets his latest assignment: field-testing the powerful psychic, but green, rookie Judge Anderson (Olivia Thirlby). But when the pair investigate a triple homicide in Peach Trees, a mega-high rise controlled by the gang leader Ma-Ma (Lena Headey), they find themselves trapped in a far more deadly situation than even Dredd could have anticipated. Karl Urban manages to make Dredd neither a cartoon nor a robot, wearing his unflappability and hatred of crime with an even tone and a perfect sneer. This is a man of order, of rules, who's fast on his feet and unmoved by violence. An especially great aspect of putting this Dredd on film is director Pete Travis' decision to treat Dredd's speech as yet another weapon in the Judge's arsenal. With a well timed bit of deadpan, Dredd can knock many of his opponents off their guard, and while Dredd's ludicrous matter-of-factness is frequently played for humor, it's never at Dredd's expense. Much will be made of this movie's violence, and with good reason. Dredd, Anderson, Ma-Ma, and her minions rack up quite a body count as they battle through Peach Trees, and we get flashes of things that are far more gruesome than a bullet to the head. But Dredd doesn't treat its victims as mere cannon fodder. Peach Trees is a slum, and we're meant to see the poverty of ordinary people, people who a few hours ago were living their normal lives, people who just want to shut their doors and pretend the entire battle outside isn't happening. Even some of the Judges' foes might never have committed violence were it not for their vulnerability to people like the psychotic Ma-Ma (who, incidentally, makes Cersei Lannister look like a naughty kitten). You'll see a lot of kids running around Peach Trees, and, as the weaponry gets bigger and the walls grow thinner, it's clear that the tower's residents will be feeling the effects of this encounter long after the Judges have closed their case files. Dredd is never maudlin on this point, but it remembers the human toll this violence takes. There's also a fair amount of black humor surrounding Mega-City One's poverty and familiarity with blood, although Dredd doesn't always feel the need to zoom in on the joke. For most of the movie, Dredd's 3D isn't particularly noticeable, but it takes the starring role during the Slo-Mo sequences. Slo-Mo, as the name suggests, causes the user to perceive time as passing extremely slowly. When a character is experiencing the effects of Slo-Mo, we see much of the action from their perspective, letting the 3D take on a painterly effect. Droplets of water or bits of shattered glass shimmer around mundane or violent moments, while the subjects soft-focused in the middle ground watch on in amazement. This makes for some bizarrely beautiful death scenes, as well as a few uncomfortable moments while the viewer contemplates how this death will ultimately play out. Dredd is, first and foremost, though, an action movie, a self-contained sequence of events that comes to a simple and satisfying ending. It does not force its Judges to confront any larger truths about their function in society, and even as we see a bleakness in Mega-City One that goes far beyond crime, we can't help but root for the virtuous Judges over the wicked forces of Ma-Ma. Much like its Judges, Dredd sets out to accomplish a very specific task, and it accomplishes it directly, effectively, and with no small amount of bloodshed.